$8 adults, ($7 Fla. residents & seniors), $5.50 ages 3-17, free to UF students & Museum members. 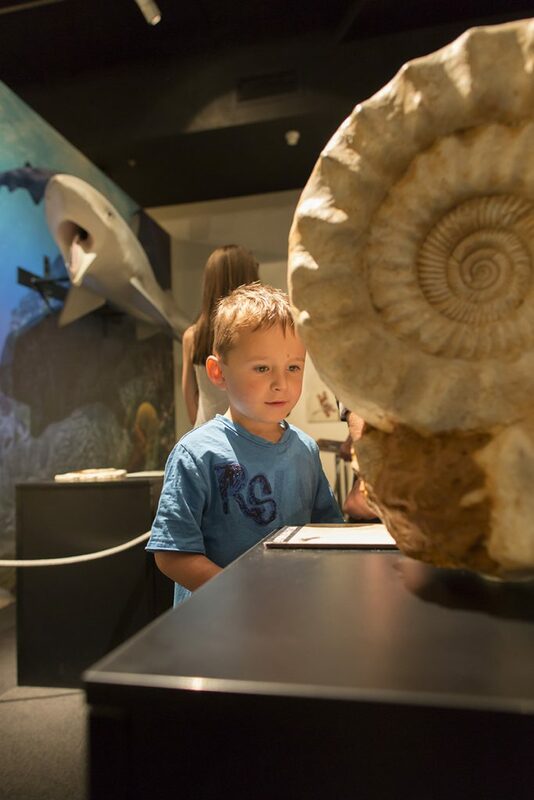 Step back in time 290 million years when distinctive creatures dominated life on land and sea, and learn about the greatest extinction the world has ever seen. 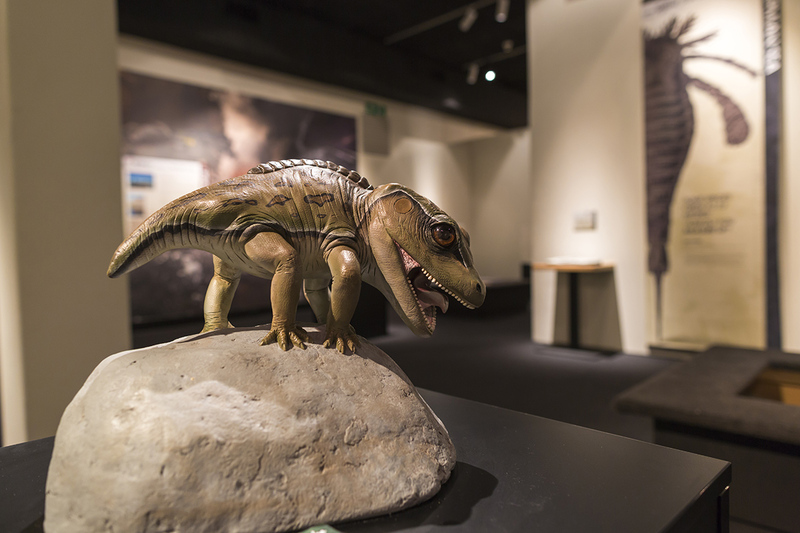 This unique exhibition brings the past to life with fossilized skeletons and full-sized replicas of the animals that ruled the world before the age of dinosaurs, in a time known as the Permian. Gain a glimpse into the period with paintings from award-winning paleo-artist Julius Csotonyi. See models of giant insects, bizarre-looking sharks and strange reptiles with mammal-like characteristics. Meet the top predator of the time, the giant saber-toothed Gorgonopsid, and sift through interactive dig pits. 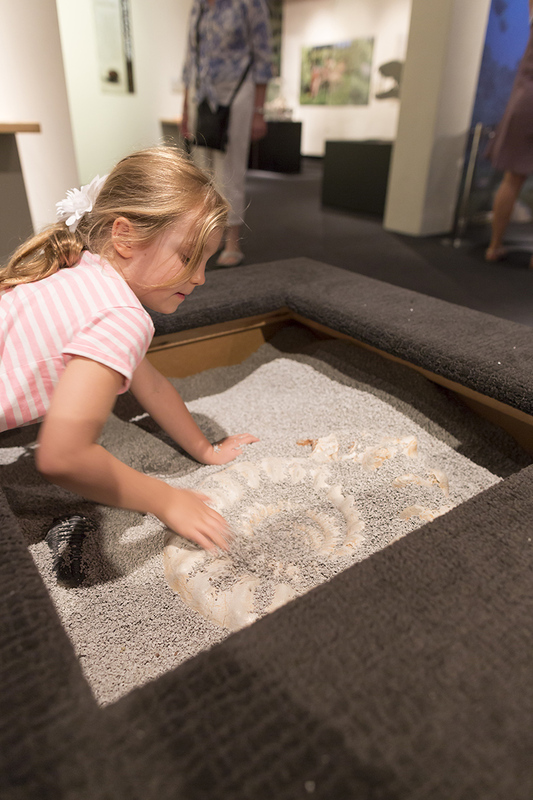 See what it’s like to be a paleontologist and sift through four interactive dig pits to see what you can find. Cotylorhynchus: The herbivorous Cotylorhynchus is considered the largest terrestrial vertebrate of the early Permian Period, stretching from 10-20 feet-long and weighing more than a ton. Dimetrodon: Similar to the dinosaur Spinosaurus, these predators possessed sails on their back which scientists believe could have served a variety of purposes including temperature regulation, sexual display or even camouflage. Dinogorgon: With fossils found in Tanzania and South Africa, the Dinogorgon was a small carnivore of the late Permian Period. With a length of roughly six-and-a-half feet, this predator preyed on small reptiles. Edaphosaurus: Despite resembling the predatory Dimetrodon with a large spinal sail, Edaphosaurus was actually a large herbivore of the early Permian Period. Estemmenosuchus: With its name translating to “crowned crocodile” in Greek, this omnivorous genus from the middle Permian Period is most noted for the horn-like display on its skull. Moschops: Measuring about 6-feet tall and 9-feet long, Moschops is an example of an early mammal-like reptile from the Permian Period. Remains of the herbivorous Moschops have been found in South Africa. Titanophoneus: From the middle Permian Period, not much is known about this large and mysterious carnivore, because so few fossil specimens have been found. 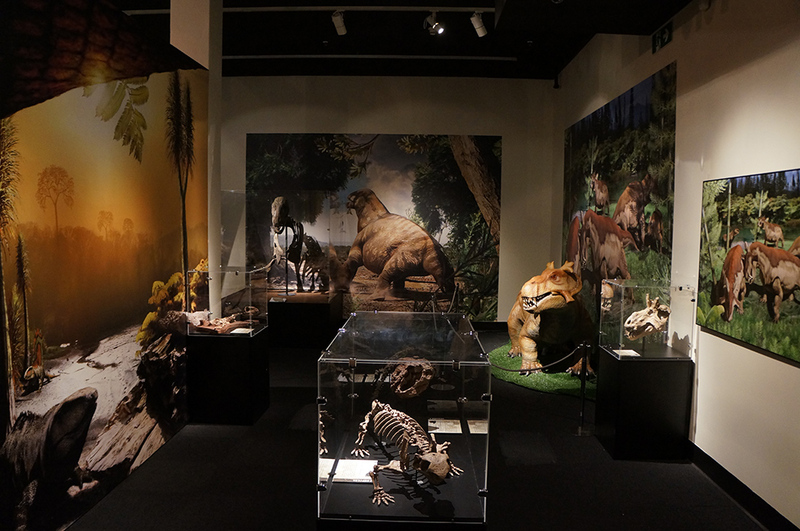 A dozen illustrations from award-winning paleo-artist Julius Csotonyi bring the Permian Period to life and give guests a glimpse at what life was like before the dinosaurs. 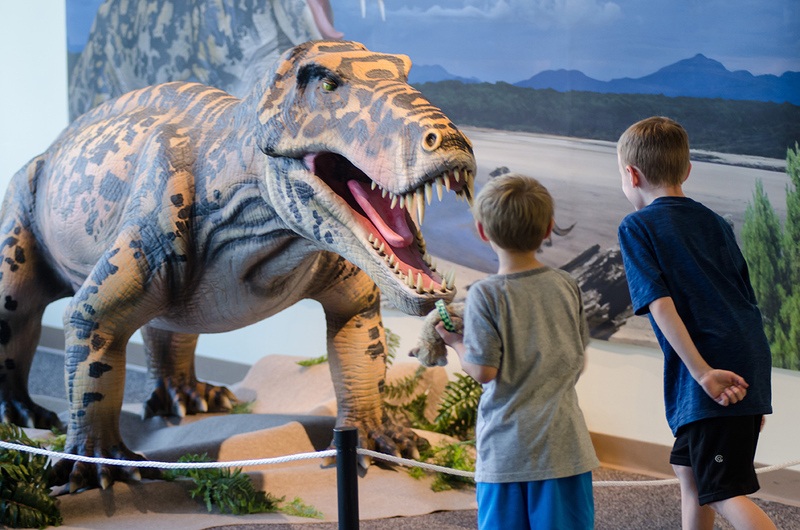 Get a feel for the Permian Period with real fossils and skeletons that guests can observe and touch. 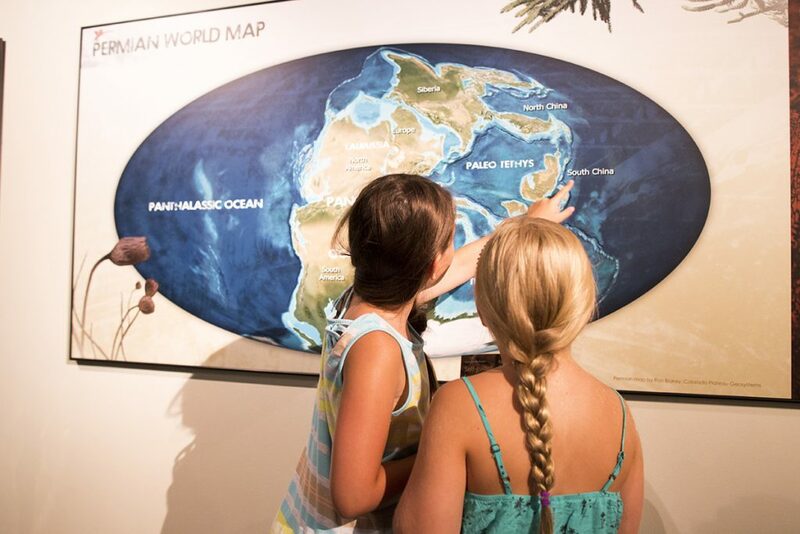 Children and adults can test their knowledge about the Permian Period at interactive game stations. The Permian Period ended with the largest mass extinction in Earth’s history when more than 95 percent of marine and 70 percent of terrestrial species were lost. This extinction is known as ‘The Great Dying’ and lasted nearly 200,000 years. The Permian Period is the final phase of the Paleozoic Era. The mass extinction that ended the Permian Period led to the emergence of new life, including dinosaurs. Archosaurs and cynodonts, animals that would later become dinosaurs and mammals respectively, began to appear during the Permian Period. Temperatures in the Permian Period varied significantly depending on the time of day, with below-freezing nights and mid-day temperatures exceeding 100 degrees Fahrenheit. During the Permian Period, all of Earth’s major landmasses were collected into one supercontinent known as Pangaea. Insects were the ultimate aerial predators because the increased oxygen in the atmosphere made them far larger than they are today. Bugs with mouthparts modified for piercing and suckling plant matter evolved during the Permian Period. The saber-toothed Gorgonsopid, the top predator of the late Permian, was a reptile the size of a large bear. They belong to the group therapsids, believed to be the ancestors of all mammals. Because most land animals of the Permian were herbivores, much of their evolution is linked to the evolution of terrestrial plant life, which was extensive in this period. The remains of Lystrosaurus, a survivor of the Permian extinction, have been found on every continent and play an important role in continental drift theory. They are also believed to have comprised half of all life on the planet at their peak. 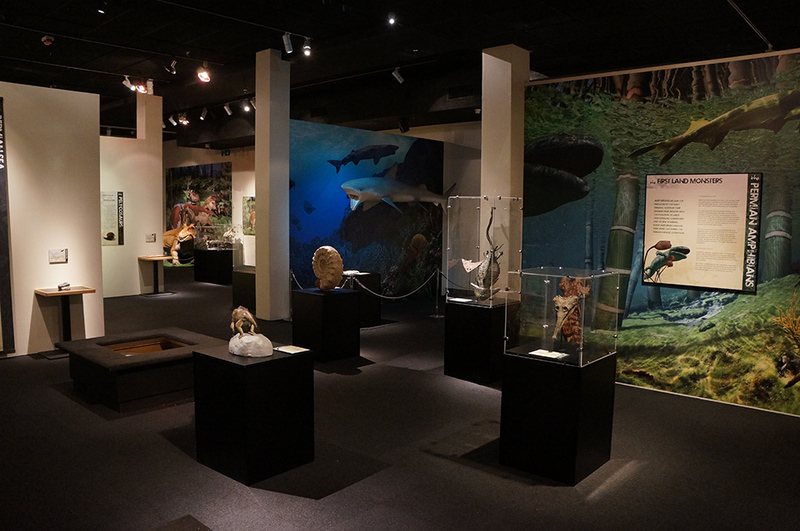 Permian Monsters: Life Before the Dinosaurs was created by Gondwana Studios and sponsored in part by contributions from Visit Gainesville/Alachua County, University of Florida Student Government and the Florida Division of Cultural Affairs.